I found this blue and white porcelain plate in a thrift store and cannot figure out the age or maker? I think it’s pretty old because it is marked in handwriting and the writing is blue. 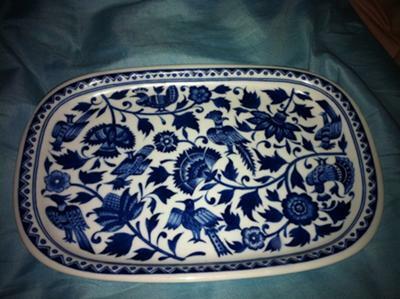 Anyone who might help with information on this very nice blue and white porcelain plate would be greatly appriciated. 1. I believe your photograph of the ‘signature mark’ on the back of your porcelain plate is upside down. 2. In Chinese culture even today the official signature is a ‘chop’ in red ink. I am not an expert in Chinese pottery so I can only offer the educated guess that a signature written with a brush would have no legal significance. 3. You might try Chinese translation sites and see if anyone recognizes the signature. It may not even be a signature. They often have forums where people who are working to learn the language can ask each other questions. Often you have a mix of Chinese and English speakers working to help each other. 4. I speak and read Japanese and to my eyes the signature mark on your blue and white porcelain plate looks Chinese, but it is hard for me to tell since it appears to be stylized, making interpretation, for me at least, more difficult. Still no identification. 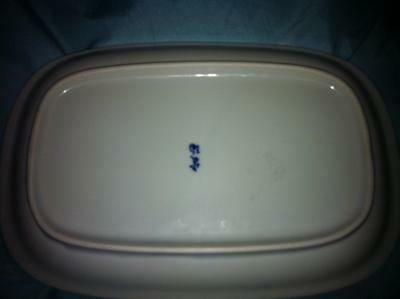 Please help identify the maker of this blue and white porcelain plate! 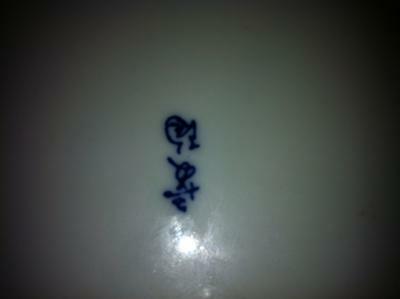 Hi, I have a blue and white porcelain bowl with exactly the same marking as yours. I have been trying to find out what it is as well, but no luck so far. what about you?